Footprinting is a part of reconnaissance process which is used for gathering possible information about a target computer system or network. Footprinting could be both passive and active. Reviewing a company’s website is an example of passive footprinting, whereas attempting to gain access to sensitive information through social engineering is an example of active information gathering. Footprinting is basically the first step where hacker gathers as much information as possible to find ways to intrude into a target system or at least decide what type of attacks will be more suitable for the target. In the following section, we will discuss how to extract the basic and easily accessible information about any computer system or network that is linked to the Internet. 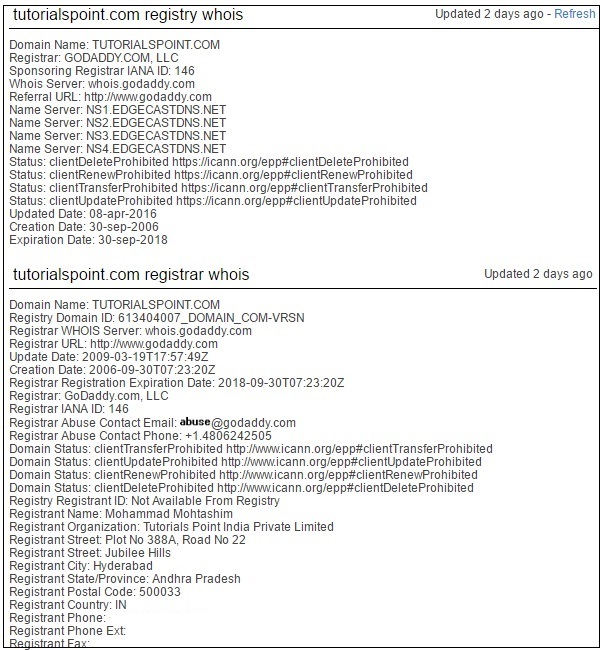 You can use http://www.whois.com/whois website to get detailed information about a domain name information including its owner, its registrar, date of registration, expiry, name server, owner's contact information, etc. It's always recommended to keep your domain name profile a private one which should hide the above-mentioned information from potential hackers. PING tutorialspoint.com (66.135.33.172) 56(84) bytes of data. 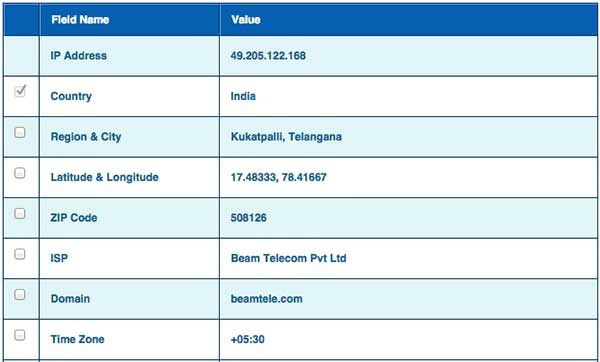 Here the ISP row gives you the detail about the hosting company because IP addresses are usually provided by hosting companies only. If a computer system or network is linked with the Internet directly, then you cannot hide the IP address and the related information such as the hosting company, its location, ISP, etc. If you have a server containing very sensitive data, then it is recommended to keep it behind a secure proxy so that hackers cannot get the exact details of your actual server. This way, it will be difficult for any potential hacker to reach your server directly. Another effective way of hiding your system IP and ultimately all the associated information is to go through a Virtual Private Network (VPN). If you configure a VPN, then the whole traffic routes through the VPN network, so your true IP address assigned by your ISP is always hidden. Small sites may have a single IP address associated with them, but larger websites usually have multiple IP addresses serving different domains and sub-domains. You can obtain a range of IP addresses assigned to a particular company using American Registry for Internet Numbers (ARIN). You can enter company name in the highlighted search box to find out a list of all the assigned IP addresses to that company. 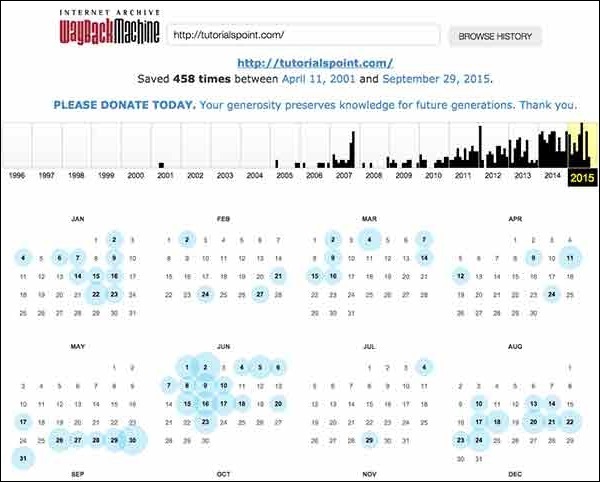 It is very easy to get a complete history of any website using www.archive.org. You can enter a domain name in the search box to find out how the website was looking at a given point of time and what were the pages available on the website on different dates. Though there are some advantages of keeping your website in an archive database, but if you do not like anybody to see how your website progressed through different stages, then you can request archive.org to delete the history of your website.